The guy behind the counter at Peddle & Paddle was a man of few words. We asked him where we should go for our first try at snorkeling. Response: "go to the end of the road". Wondering which beach that might be, I tried to get an actual name out of him. Nope, he wasn't gonna tell me. "Just go to the end of the road, that's all you need to know". I found out later that the beach at the end of the road is called Ke'e. We liked it there. The next day, we tried Poipu Beach in the south of the island. It was a beautiful beach, but much more crowded. Jody shaved off his goatee in the parking lot so that he could get a better seal with his mask- it had leaked too much the day before. 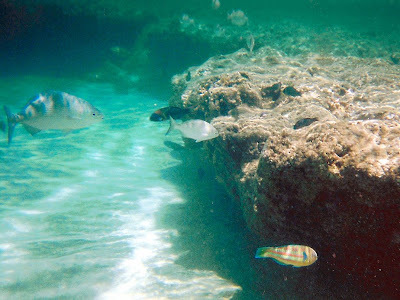 The snorkeling at Poipu turned out to be difficult; the surf was too powerful. I ended up with a mouth full of saltwater and a bikini full of sand. So the next time, it was back to Ke'e. 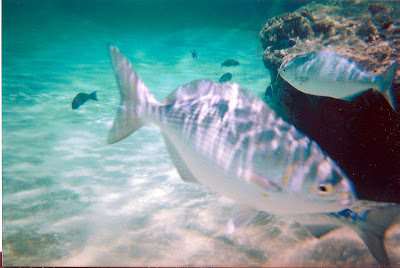 We bought one a disposable underwater camera, but using it was more difficult than I'd anticipated. The fish just won't stay still, and I neither could I! I also found it hard to look through both the mask and the viewfinder at the same time. Next time, I would invest $100 in the mask/camera combo a friend had recommended to us. Great blog! I've been roaming around the travel circles to find people that like sharing their trips and itineraries. I work for a travel tech start up called Find My Itin. We're currently doing some research on how travelers plan trips. The survey should be pretty quick to fill out and we're sure that you'll have some valuable feedback. If you're interested, we would welcome your expertise.